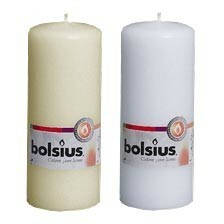 15 x 6cm Euro Classic Pillar candle, individually wrapped in cello. Available in ivory or white. Superior Quality creates Superb Ambience. This European Quality Candle is a bright white and is individually wrapped in cello. Pure ingredients ensure a superior burn quality. Burn time 43 hours, Dimensions: H 15 cm Diam 6 cm.